Oswald in the Doorway (not) : the blog of the Oswald Innocence Campaign,debunked by Lance Uppercut: Ralph Cinque fails in Dealey Plaza UPDATED! Ralph Cinque has once again ventured to Dallas in another half - assed attempt to validate his debunked ramblings about the Moorman photo. Predictably, the results reveal he has no idea what he's talking about. how the Moorman photo contains an easily identifiable reference alignment which any recreation MUST contain to have been taken from the correct position. The point sailed over Ralph's head of course, but that was to be expected. The answer...not very close, although in all honesty a little closer than I expected. The "cross" alignment that we see in Moorman is a long way off because he's too far to the right of Moorman's true position, in keeping with his incorrect assertion that the photo was taken by the Babushka Lady, who was situated over 15 feet to the right of mary Moorman. Interestingly though, he's also a long way short of taking the photo from the correct position of the Babushka Lady. Why? Well I'm betting that he tried. I'm also betting that we'll never see the results of those attempts. Well in simple terms Ralph, it proves you were standing in the wrong place. It demonstrates that you were too far to the right of Moorman's position. And in doing so it proves very nicely that the Moorman photo could only have been taken by Mary Moorman. The further from the correct position that you go, the more the alignment of the cross is disrupted. Easy really. What you HAVE succeeded in doing is to provide a very nice demonstration of why your "Babushka Lady took it" idea is utter nonsense. Simple and easy to follow example of why the cross is the "Rosetta Stone" pointing to Moormans true location. I am very troubled with the unscientific and amateur photographic work of Ralph Cinque. One of his main goals was to understand the physiology of the motorcycle cop (especially Martin's right arm), as it appears in the Moorman photo. But in Cinque's photo, it appears as if his cyclist is stationary, as opposed to moving. 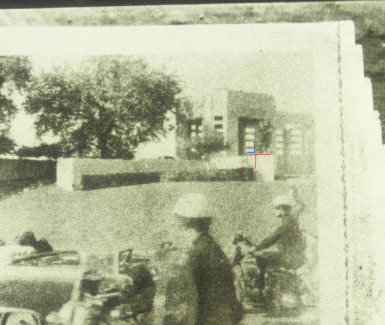 The Moorman photo captured a set of vehicles that were in motion, with a resulting blur effect, especially in the image of the motorcycles that were so close to her. Unless the photo recreation includes a cyclist that is actually moving, then it is not a bona fide photographic recreation. In an e-mail sent to me by Ralph on August 25, he indicated that one of his major goals was "to show the impossibility of what we see of BJ Martin in the Moorman photo." But that goal was not accomplished with Ralph's photo. We needed to see an entire image of the outrider on his bike and, above all, the recreation of a motorcycle that was slowly moving down Elm Street. 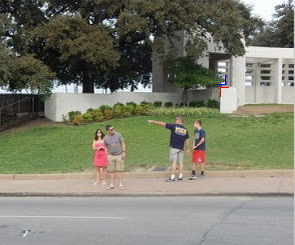 In the final analysis, Ralph's photo recreation in Dealey Plaza was no different than the photo he snapped in his driveway. His study has told us nothing new about the Moorman photo or the assassination. Like his work on the Altgens6 photo, this new project has only served in creating confusion. Ralph also indicated that this was to be a group project. But I have yet to read any other accounts of this experience or any support of Ralph’s conclusions from OIC members or individuals who participated in the venture. Well there was no need whatsoever to go all the way to Dealey Plaza to test the concept of a motorcyclist's right arm appearing in the corner of a photo. Plenty of examples have already been given to Ralph which show this to be perfectly possible. As I noted in my update though, Cinque's trek wasn't completely without value - because it provides a good demonstration of exactly why he is utterly wrong about the Moorman photo. Forget Cinque. Focus on deM's boss Anastase Vonsiatsky known as "Annie" at the Winnipeg Airport Incident. And Wickliffe Draper, his neighbor and sponsor who started The Pioneer Fund. Good piece, Lance. It shows Cinque didn't even bother to line things up correctly. Thanks, Lance. We should have asked Jerry Dealey to videotape the whole debacle, then donate it to the Sixth Floor Museum, so future generations of Kennedy researchers may refer to it.